Investors deposited a record level of gross contributions into 529 college savings plans with $33 billion in 2018, compared to $29 billion in 2017. Investors deposited a record level of gross contributions into 529 college savings plans with $33 billion in 2018, compared to $29 billion in 2017. Building upon this level of investor interest, the college savings plan market totaled $311 billion in assets across both 529 savings and prepaid plans as of December 2018. Among these two types of investment products, 529 savings plans have experienced the strongest growth in assets in the long-term despite the market volatility in 2018. That segment of the market managed assets of $289 billion as of the end of December 2018, compared to $294 billion in December 2017. Market volatility prevented the market from growing in terms of assets as much as it grew in 2016 and 2015, when it managed $251 billion and $230 billion, respectively. From 2015 to 2018, 529 savings plans experienced strong and consistent compound annualized growth rates of 7.8%. Therefore even with the market volatility in the fourth quarter of 2018, the industry’s long-term momentum has been strong enough that 529 plans have seen investor interest (as indicated by gross contributions) continue to grow on a year-over-year basis. States have continued to act hesitantly in expanding the 529 prepaid market. 529 prepaid plans act similarly to defined benefit accounts, allocating the market risk to the state entity instead of families. 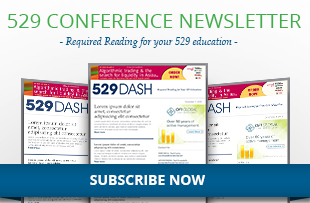 The 529 prepaid plan market has not experienced a brand new launch in over a decade. 529 plans were able to demonstrate a greater stability than a number of other registered investment vehicles in the year. The 529 industry saw 2018 net new flows grow to $8.4 billion, compared to $7.4 billion in 2017. This was in fact the highest period of net inflows since 2013 which reported $8.5 billion for the year. 529 periods of net redemptions are almost entirely limited to the third quarter of each year when fall tuition payments are due, and are therefore based around the core usage of 529 plans as opposed to being a sign of reduced investor interest or confidence. 529 plans have retained their appeal thanks to the increasing cost of college as well as improvements to 529 products. 529 plans are not only seeing substantial increases in gross contributions and net sales, but also in levels of demand due to rising student loan debt levels. As student loans grow to new heights, so does awareness and prioritization of the college financial planning and 529s. Since the pace of rising student loan debt is not expected to slow down in the near future, demand for 529s will continue to rise as they provide a solution to families by helping them to save and save efficiently for education. The increase in tuition has been a driving factor in both increasing debt levels and the need to employ 529 plans. The cost of education as measured in tuition, books, fees, room and board, and other expenses has consistently outpaced the consumer price index (CPI) and almost all other benchmarks of cost of living price increases. Tuition inflation and rising debt will both serve to stress the importance of college financial planning and 529 plans. Additionally, a number of product developments have launched or are in the pipeline, including enhancements to the gifting and technology platforms, employer benefits, and digital capabilities. Several federal bills have been introduced to expand the capabilities of 529 plans, including the growth of qualified expenses which will help broaden usage of 529s to even more families. 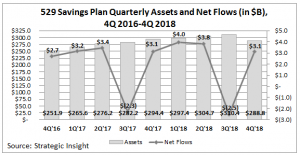 Therefore, 529 plans continue to attract investor interest in terms of gross contributions, and these industry trends are expected to accelerate the product’s demand and growth going forward.